"Prostration during final vows ceremony"
Prostration during the final vows ceremony. Little Bothers of St. John the Baptist: Fr. Vincent Lebbe: third in the front row. 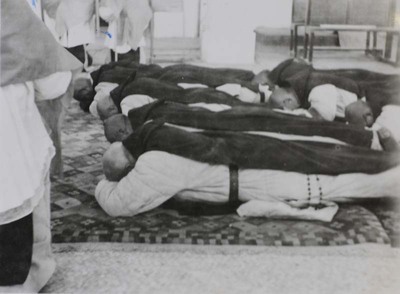 Prostration during final vows ceremony. December 24, 1933. Société des Auxiliaires des Missions (SAM) China Photograph Collection, Whitworth University Library, Spokane.